If you are following me on Instagram, you might have known that this year, I’ve been picking up a lot of creative projects in my spare time. Or maybe, I have really positioned my creative life on the top of my priority list. I started to pick up some of the things I have abandoned before, including painting, crafting, creating art, and journaling. Interestingly, these are the things I have always enjoyed doing when I was little. I have filled in several journals (from cover to cover, around 15 books all in all) in my life, especially during my teenage years. I always believed that writing keeps me sane, and journaling helps me navigating my chaotic life during many of my coming-of-age episodes. When blogging came into the picture, I started using it as a platform for me to post my chaotic thoughts, building what might later turn out to be a ‘digital journal’. However, I have to admit that I miss the act of journaling on a physical notebook: seeing the way my handwriting changes, seeing the tear-stained pages, or festive fonts on celebratory days. There are certain emotions that digital platform—like blogs, or even Facebook Memories—could not evoke in me; the way a physical journal could. These days, when I flipped some of my teenage journals, I could also remember those happy days of going to a stationery store with my mother to pick a new book. I could still feel the giddy feeling, the excitement, and the confusion of having to make decisions upon seeing those beautiful books and diaries. In the end, I could only pick one—the one that ended up coming home with me: becoming the source of my anger, sadness, happiness, and frustrations. This month, I picked up journaling again, diligently. I got myself a Midori Traveler’s Notebook that I had been eyeing for more than 3 years now (always postpone yourself from buying things immediately; this is how you know if you really want something! ); and started writing. I also have my daily bullet journal on the side (a cheap notebook I bought at Miniso), but the Traveler’s Notebook soon becomes my mood-lifter journal (the one you see in this post, where I collect things that can lift up my mood) and my travel journal (because those pictures and mementos got lost in the digital world). I also started journaling while scrapbooking and making collages; then learning how to press flowers to be pasted on my mood-lifter journal. It feels so good to finish a spread and re-reading my life as I flipped through the pages. Do you think you’d like to start a habit of journaling as well? JOURNALING 101: SO YOU WANT TO START JOURNALING? 1. Start with a thin + cheap journal/notebook, and fill it in from cover to cover. Don’t make a mistake of investing too much before picking up a new hobby. Try it out first. Who knows, maybe you don’t like it, maybe it’s not for you, maybe you lose interest quickly. If you want to start journaling, just pick up a notebook you already have (you can redecorate the cover and the pages) or get a cheap and thin notebook (around 48 pages). Once you have this book, fill it in from cover to cover with anything: words, quotes, pictures, thoughts, candy wrappers… anything. But, finish the book. It may take you one day, one week, or one year. It doesn’t matter. The goal is to finish it. If you can fill it in from cover to cover, it’s a sign that you’re in for the journaling journey. Only then, allow yourself to get a new journal you’ve been in love with. 2. Start with anything but a bullet/daily journal. Keeping a bullet/daily journal can be a daunting task because you feel as if you need to write on it every single day (actually, you don’t have to—but I’ll talk about my own bullet journal style another day). The original system, however, works beautifully when we are committed to logging in our notes on a daily basis. For me, the downside was the feeling of ‘failure’ when I missed a few days—leaving a gaping hole in my bullet journal. Somehow, there is a feeling of ‘ruining it’ and the feeling can linger for quite some time, making me feel somehow demotivated. But if you’re also the kind of person who would feel that way, don’t start with a bullet/daily journal. Try to keep a journal that you can fill in whenever you feel inspired; something that won’t burden you with daily commitment. A gratitude journal. Where you list down all the things that make you feel grateful. You can also paste gift wrappers from a gift you received, pictures of your friends and families, as well as writing down happy events/moments in your life. A mood-lifter journal. Where you can collect things that lift up your mood, like your favorite songs, quotes from a book you love, pictures that evoke a happy feeling inside of you, a letter from a lover, pictures from your last traveling journeys… anything. The idea is to have a collection of things that will make you smile when you see it again in years to come. A dream journal. Where you can dream and design your ideal life. What would you be like? What would you do? Who are you with? Where would you be? How would you feel? It’s amusing to play this game and start filling the journal with your vision of an ‘ideal life’. Don’t forget to include every aspect of your life: family and friends, career and study, spirituality, health, and many more. Isn’t it nice to flip the pages of this journal every morning, to remind you of where you’re heading in life? A learning journal. Where you can write down the lessons you’ve learned in life. These lessons can be an experience you’ve been through, an advice from someone you respect, a quote that speaks to you from a book, a movie with a certain message that is relevant to your situation, or simply new things you learned from the Internet. A letter journal. Where you can write unsent letters to different people in your life. If you tend to avoid confrontations and like to repress your feelings, writing an unsent letter is a great way to channel your feelings and say the things you wish you could say. Or, you could also write a letter to a singer you like, a movie star you adore, a random guy you’ve seen at a coffee shop, a great-great-great grandmother you’ve never known. Let your imagination go wild. Surely, the ideas are endless. But you got the point. Start a journal that doesn’t need your daily commitment, yet. At least, not until you’re ready to commit. The goal is, again, to fill in your book from cover to cover! The feeling of completion is a great feeling that will get your confidence-level up when you want to take up daily journaling later on. 3. Find a friend or a community. 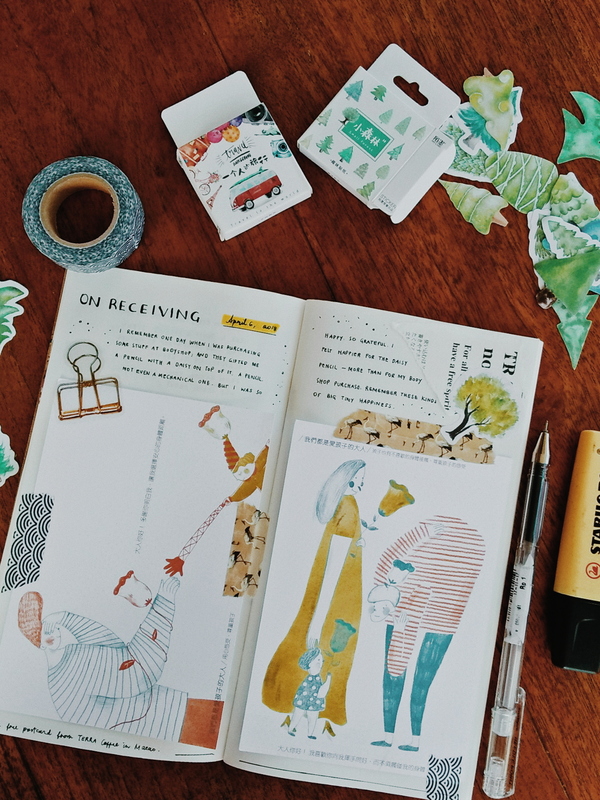 Picking up journaling as a (potential) hobby doesn’t have to be a lonely feat. You can find some friends who love journaling and organize a Journaling Day-out where you compete to fill in your 48-page journal as fast as you can. Or find some videos on YouTube to get your dose of inspiration; and follow people who journal—just like you. Being surrounded by people who share the same interests with you (even online) can make you feel motivated and inspired. Fill in that 48-page journal however you like it. Don’t think too much. Take it as a personal project, as a practicing canvas. You don’t need to show it to anyone. Treat it as your experimental journal, to see how you’re approaching the art of journaling. Get yourself used to making mistakes. Don’t worry about smeared pages, crumpled edges, blotted ink… remember, your task is only to fill in your journal from cover to cover. Just let yourself loose, and be honest. Pour your thoughts and feelings on the pages. The more you journal and make mistakes, strangely, you will gain more confidence. The more you hate the spread or the pages you’re working on, the more you’ll know what you like. One day, there will be a time when you’re working on a spread in your journal and love it. Maybe it’s not perfect, but you feel like: this is it. And that’s usually the day when you know that you’re ready to take journaling as a new hobby. Until then, your life is a story. 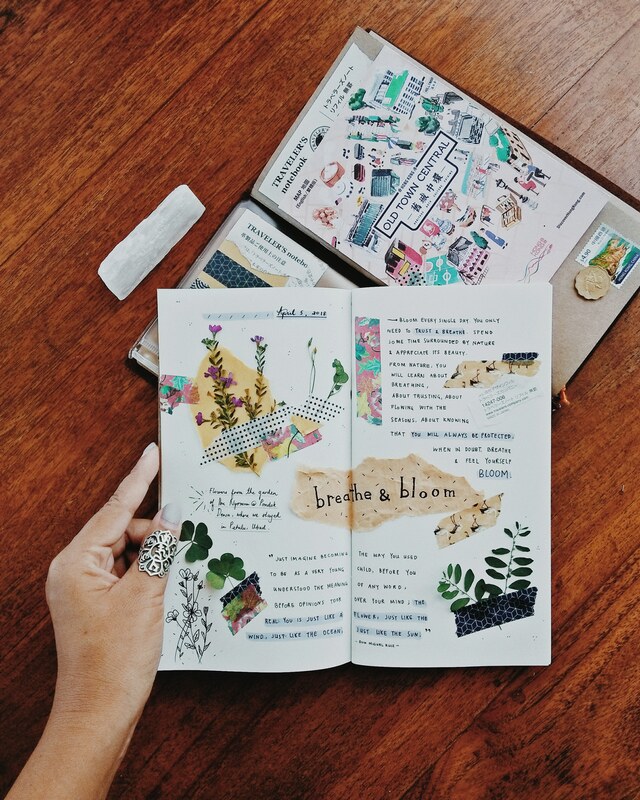 Your journal is so beautiful! I’m using traveller’s notebook (not the original one, I use local traveller’s notebook becuase the original one is so expensive for student like me hahaha). it’s so fun to journaling on tn, I use my tn for planning too. For planning I’m using original insert vertical weekly (if I’m not wrong the number of the insert is 18) from traveller’s notebook. If you want to see my journal you can visit my journal account on ig too hahah XD My ig account @firthstudy 😀 Happy Journaling! Aku suka ngejurnal dari dulu tapi yah plain banget. Nggak seribet dan seindah orang-orang punya. Pengen sih tapi apa daya, nggak punya jiwa seni. Akhirnya malah jadi uwet-uwetan dan kayak buku coretan, hiks!